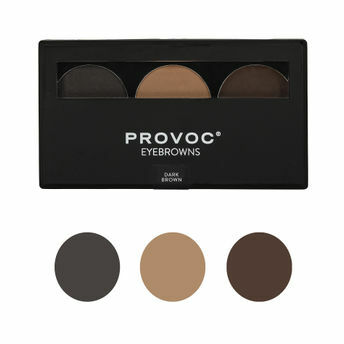 Shape your brows for an ultimate natural look with Provoc's Eyebrow Palette. This kit includes three long wearing shades and highly blendable shades that deliver expertly shaped and defined brows in a matter of minutes. It is a must have for brow perfectionists. About the Brand: Provoc is a Middle Eastern cosmetic brand known globally for their bold, innovative and modern makeup products. They have a wide range of versatile makeup products such as eye lashes, lip liners, brow pencils, eye pencils that are long lasting and in trend always. All Provoc makeup products are Cruelty-free and Vegan. Explore the entire range of Eye Brow Enhancers available on Nykaa. Shop more Provoc products here.You can browse through the complete world of Provoc Eye Brow Enhancers .Alternatively, you can also find many more products from the Provoc Eyebrow Pallete range.